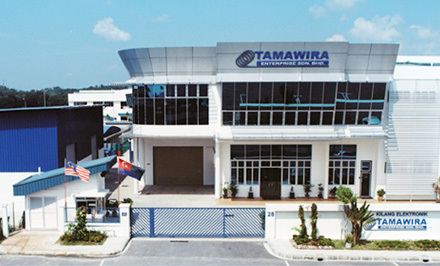 Tamawira Enterprise Sdn. Bhd. was established in 1995 with an ambition and vision to support the electronics and automotive industry worldwide. The current principal activities of Tamawira Enterprise are manufacturing of high quality precision springs, wire-forming and inductors in almost all shapes and sizes to meet our customers' needs. Tight manufacturing tolerances, superb quality management and on time delivery are our pride. We deliver in over ten different countries and are able to communicate with our customers in Bahasa Malaysia, Chinese, English and German. Tamawira Enterprise Sdn. Bhd. is situated at the most southern tip of peninsular Malaysia. The Senai International Airport, Singapore Changi Airport, Port Tanjung Pelepas and Singapore Port are in a 1 hour radius around us. These efficient facilities enhance exporting our products worldwide. All activities involve up-to-date technology, and have always been governed by a stringent quality control system, to ensure high standard of quality and reliability in its products. Our Mission is to be a leading regional manufacturer of high quality precision springs, stamped parts, assemblies, and inductors (air wound coils), as well as miniature transformers by providing products with the highest level of technical excellence and reliability, coupled with responsive, flexible and cost-competitive service to ensure total customer satisfaction.